Blondie and Brownie: Free Cone Day and 50 cent Iced Coffee Day! 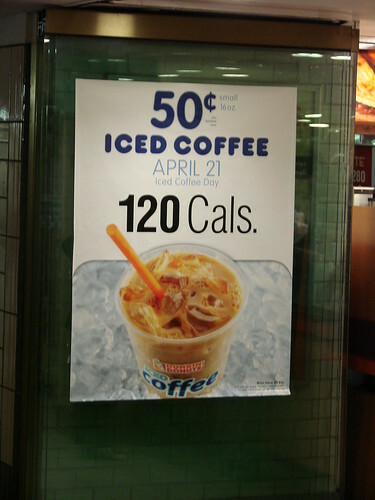 Last year Dunkin Donuts did a similar promo in May with Free Iced Coffee and the line was around the corner. 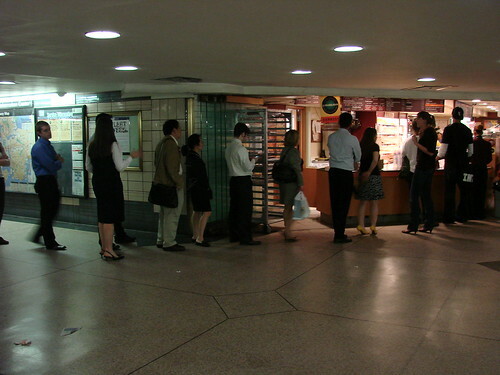 I wonder if the lines will be as crazy for 50 cent iced coffee. The good news is for each small Iced Coffee purchased today, Dunkin' Donuts will donate five cents to benefit Homes for Our Troops, a national, non-profit organization that builds specially adapted homes for severely injured veterans. Good cause. Now here's the drill for Free Cone Day. Stop by your nearby Ben & Jerry's between noon and 8:00 p.m. for a free scoop. Ben & Jerry's Rock Center will be mobbed and overwhelming, but in my experience the line actually moves pretty quickly. Best to go with a friend so one of you can do flavor recon as they rarely have the list of available flavors posted. I've always had good luck towards the end of the day--post 5:00pm. Most people take off after work so you probably should be safe anytime after 6, though you could run the risk of missing out on your fav flavor--depends on if your priority is flavor selection or crowd avoidance. Ben & Jerry's on Third Avenue aka the NYU Ben & Jerry's will be packed with Violets jonesing for a mid study session cone. True story...on my way to Free Cone Day during my NYU years we ran into one of my roommates cone in hand on her way back from Ben & Jerry's. She promptly turned around and joined us on our walk. By the time we got to Ben & Jerry's she was done with her first(?) cone and ready to get in line for her second. If you think midtown workers are likely to be repeat Free Cone offenders just think about incomeless college students paying 50k per year. Yeah, um, avoid. this is truly a great day in food history. i'm glad it comes around once a year too. I love smart marketing and THIS is smart marketing! Offering these kinds of deals is such a low cost to these giant retailers -- probably they even still make a profit because it cost so little to product coffee (actually they are def still making a profit), but even if they just break even this is a great PR tool. Even a small act like offering $.50 coffee gets them free advertisement basically in all these blogs because people are so hungry for deals. There's a great book that just came out called "The Power of Small" that explores this topic. Small things, especially in this economy, really do make all the difference. I find the best time for Rock Center to be around 12p. People don't seem to want to start their lunch with dessert. I, however, have no such qualms.